The latest handset from the blossoming Nokia and Windows Phone partnership has been leaked, with the Lumia 910 appearing on a Dutch retailer's website. The as-yet-unannounced Nokia Lumia 910 looks to be practically identical to the Lumia 900 recently announced for US market, exclusively on the AT&T network. The only difference between the 900 and the 910, according to the Dutch site Typhone.com appears to be an upgrade to the camera. The listing claims that the device boasts a 12-megapixel camera, rather than the 8-megapixel offering served-up by the Lumia 910. Is this our version of the 900? Naturally the site says that Windows Phone 7.5 will be on-board when the device eventually lands, although there's no date attached to the holding page. 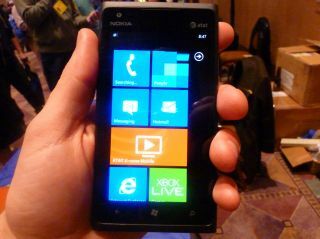 It was thought that the Lumia 900 would be coming to UK shores this summer, the 910 could be the device that eventually lands on UK shores.